For the last 28 years I have been designing and building stained and etched glass designs using patterns drawn by the standard methods. I heard about computer-drawn patterns made by Paned Expressions Studios, so I had them draw and print patterns from my original drawings using Glass Eye 2000. I was impressed with the ability to make rapid glass color choices, and instant pattern changes, and the ease of email communications. I decided it was time to learn Glass Eye 2000 myself. It was a bit of a learning curve for me, but now I enjoy using the software to draw patterns so very much. I certainly thank Dragonfly Software and Paned Expressions for their help. As a result my patterns are now helping me make a living. Paned Expressions are the publishers of my five CDs: "Oceans & Islands", "West by Southwest", "Mirror Images", "Water, Water Everywhere" and the just released "Pattern PROFusion". All the CDs contain 60 to 90 unique patterns. Several patterns on my newest CD contain trees. Aspens have been my favorite for years. I live at an altitude of 7000 feet in northern Arizona where aspens are everywhere and fall is a season of beauty and brilliance! Cut an 11-7/8" square piece of clear fusible glass. Cut two pieces of fusible thin yellow opal: 2" x 10". 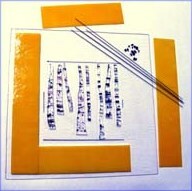 Cut two pieces of fusible thin yellow opal: 2" x 6¼". Cut eight tree trunks of clear glass containing black streamers and black frit, or glue black stringer and black frit to clear glass and make your own. Cut four pieces of either gold dichroic noodles or matching yellow opal noodles: 2" long. When you print the pattern, tape a copy of the finished piece behind the clear glass so you can place the trees where they should go. Use fusers glue to secure the trees as you lay them down. While wearing a respirator mask, take a clear plastic container and mix marigold opal medium frit with other fall colors of your choice to create the tree leaves. Tangerine, yellows and butterscotch opal frit all look good in the mix. "Paint" fusers glue on the top third of the tree trunks and the clear base glass. Sprinkle or spoon the mixture of tree leaves from the top to the area where the gold stops on the pattern. Be sure to let some of the tree glass show through the mix. Pile a little extra frit on the very ends of the tree tops so the top edges don't show through. Mix black and dark brown fine frit in a container. Paint more fusers glue over the areas shown in black on the pattern. Spoon the frit over the area. Take a small painters brush and remove any black/brown frit from the tree trunks. Paint glue from the bottom of the black/brown frit to the bottom of the piece. Take a fine sieve and place a full spoonful of orange fine frit inside the sieve so you don't spill it on the way to the piece. Hold the sieve over the area just glued and tap the side gently to release the powder. Do another layer of orange. Mix a very small amount of more fall leaves colors of frit and sprinkle a little around the bottom edge under the trees. Be sure to remove any frit from the tree trunks. Glue and place the yellow opal border glass pieces about 3/8" from the edges of the clear base glass making sure they all meet closely together. Glue and place the 2" noodles on the "cracks" where the yellow glass meets together. 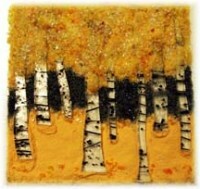 When the glue has set, move the piece into your kiln and fire. In my kiln I fired the piece to about 1450 degrees held it only a minute or two checking it visually till it begins to melt the frit. If you want to fuse a dish or bowl then firing to a full fuse is suggested. The finished piece fits nicely in a tabletop display. These scenes are very successful in my gallery so I have attached another version for you to see as well. While Glass Eye 2000 doesn't contain frit visual samples or all the glass used in fusing, I have substituted a glass for each frit color that looks similar to the finished product in the downloaded pattern. Some glass used is not fusible. 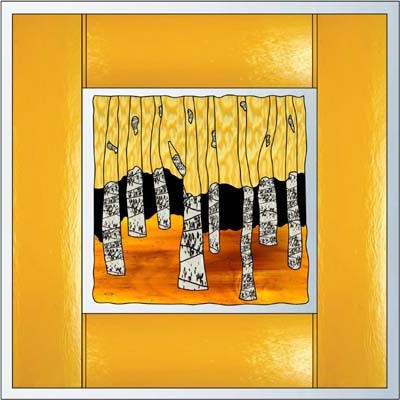 Judi began working in stained and etched glass professionally in 1980. 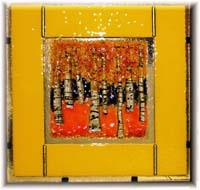 In 1995 she opened a retail and commissioned glass studio with half a dozen employees. In 1999 she opened two home studios in Flagstaff, Arizona and continues her commissioned work, gallery and juried show sales. 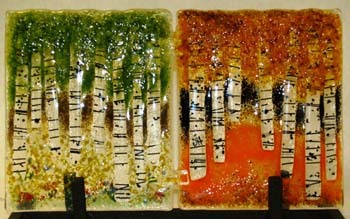 In the last few years her sales of fused glass work has increased dramatically. 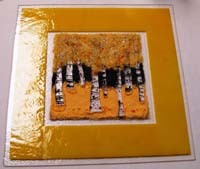 Some of her work can be seen on her website and her patterns can be viewed and purchased from Paned Expressions.